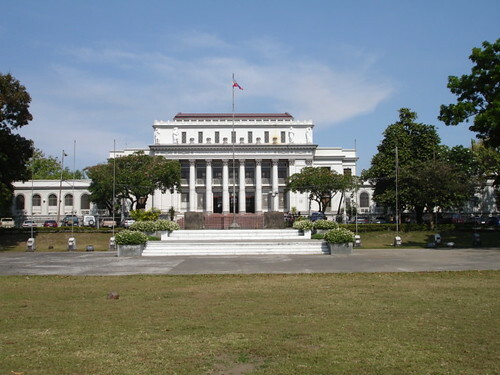 Three blocks north of the cathedral, bound by Gatuslao and Lacson Streets is the provincial capitol complex. This consists of the capitol building and an artificial lagoon in a spacious park, in front of it. The capitol was built from 1924-35, following the Beaux Art style favored by the city planner Daniel Burnham, who came to the Philippines early in the century upon the invitation of William Cameron Forbes, appointed as governor general in 1904. Burnham recommended William Parsons as consulting architect for the Philippine government. Parson arrived in 1905 and organized the architectural office of the Bureau of Public works in which were employed American and Filipino architects, including Tomas Bautista Mapua, Juan Nakpil, Juan de Guzman Arellano. The Bureau favored the Neoclassic style for government buildings setting a pattern for many provincial capitols. Heritage features: The Bacolod Provincial is planned as an E. The central section is marked by a three story colonnade crowned by Corinthian capitals. From this central portion wings run parallel and come to a stop at wings built perpendicular to the central structure. Entrance to the capitol is through wide stairs equal in length to the colonnade. Three entrances lead to the central lobby. Directly in front twin staircases in tropical hardwood lead to the main session hall of the building on the second floor. Long corridors to either side of the lobby lead to the wings flanked by office spaces. From the second floor secluded and narrow flights of stairs lead to an upper gallery (corresponding to the attic in the Neoclassical design) from which visitors could watch the proceedings of the provincial council. Sculptures decorating the capitol and the adjacent lagoon are attributed to Guillermo Tolentino, national artist for sculpture. In 1993, a new capitol was built at an adjacent lot. The governor’s office was transferred to the new building and the central part of the capitol given to the judiciary. Since the construction of a new hall of justice, the central portion of the capitol has been transformed into the Negros Museum. This entry was posted on July 27, 2006 at 10:49 am	and is filed under National Historical Landmarks, Negros Occidental, Provincial Capitols. You can follow any responses to this entry through the RSS 2.0 feed. You can leave a response, or trackback from your own site. MANILA, Philippines – It literally took Silvana Ancellotti Diaz years of determined search to piece together the life story and artistic legacy of her compatriot, Italian sculptor Francesco Riccardo Monti, who left his native Cremona and a multi-awarded career in 1929, journeyed through San Remo, Nice, and New York City, before ending his wandering a year later in Manila, where he permanently stayed until his death in 1958. Some of Monti’s public sculptures still stand today. An outstanding pair of figures, of a woman and a carabao, is found in Bacolod City and at the Bureau of Animal Industry in Quezon City.